Today, I have my most used and favorite indie polish for this fall. This one is by Sindie Pop Lacquer. I blogged about her other polishes Golden Raspberries and Sea of Dreams recently. I purchased this next polish along with those 2 others that were a part of her fall collection. Velvet Darkness is a deep purple base with micro silver holo glitters, silver hex glitters, and fuchsia hex glitters. This is amazing! If this makes sense, I'm a big fan of non-traditional seasonal colors. You know the ones that read as holiday or fall, but are not literal representations? This is completely a perfect fall color without it being the traditional orange, red, yellow, etc type of color. The deep purple base is the highlight of this color. It is unexpected, and it reads as a deep purple on the nail, not as a black. The glitter is great addition. I love how you can see the previous coats of glitter layered under the jelly, it's a cool effect. Can you tell I love it? The formula as nice on this one too. It was easy to apply. I purchased this one from Sindie Pop Lacquer's website. Sindie Pop is having a special for Cyber Monday where all of her polishes are $7 for today only! 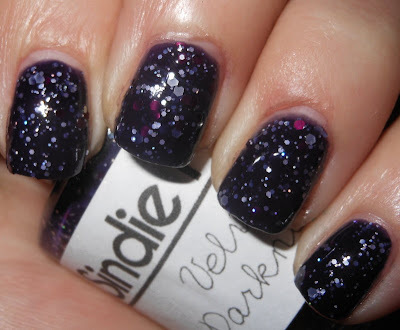 If you'e a fan of indie polish or jelly glitter, I highly recommend you pick this one up! This is super cute! Love the combo of glitter with the sprinkling of fuchsia glitter in there! Love this one - it's got enough of the right bling in it to show up in that really dark base. Vote for the Best of 2012!